In the previous Command Battlecruiser introduction blog we unveiled this new ship type and the Inspiration mechanic. In this blog we’ll reveal these ships’ stats, console abilities, set bonuses and starship traits. This Tier 6 starship is an engineering centric variant of the Command Warbird. It features more engineering console slots and engineering bridge officer seats than the other Command Warbird variants. This Tier 6 starship is a science centric variant of the Command Warbird. It features more science console slots and science bridge officer seats than the other Command Warbird variants. This Tier 6 starship is a tactical centric variant of the Command Warbird. It features more tactical console slots and tactical bridge officer seats than the other Command Warbird variants. 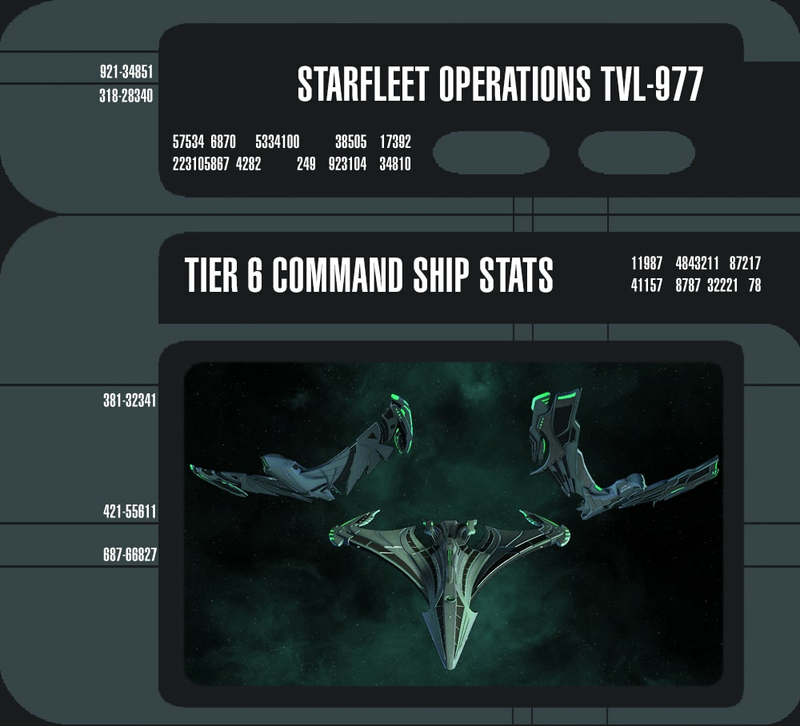 The Concorde, An’quat and Baratan class Command ships come equipped with the Fleet Support Platform. While the Fleet Support Platform console is equipped, your starship can launch a mobile shield repair platform that will follow your starship for a while. Allies within 3km of the Fleet Support Platform will have their shields repaired and hardened. This console also provides a passive boost to maximum hull hit points. This console may be equipped on any Command Battlecruiser or Command Warbird, but can be put into any of their console slots. You may only equip one of these consoles. The Geneva, Klinzhai and Deihu class Command ships come equipped with the Tachyon Pulse Platform. While the Tachyon Pulse Platform console is equipped, your starship can deploy a stationary shield draining platform. Enemies that get too close to this platform will have their shields rapidly drained. This console also provides a small passive boost to shield hardness and shield healing. The Presidio, An’quat and Vastam class Command ships come come equipped with a Defense Platform. While the Defense Platform console is equipped, your starship can launch a formidable weapons platform. This platform will be deployed at your current position and will fire beam arrays at nearby enemies. Additionally, it will deploy a large number of mines in the vicinity. Once these mines are detonated, they will be replaced after a short time. Equipping this console also provides a moderate boost to projectile damage. After achieving level 5 in the Concorde, An’quat or Baratan Class Command ship’s starship mastery, you will unlock the Improved Brace for Impact starship trait. While this trait is slotted activating Brace for Impact grants you a very large amount of Temporary Hit Points for a short period of time. After achieving level 5 in the Geneva, Klinzhai or Deihu Class Command ship’s starship mastery, you will unlock the Improved Tachyon Beam starship trait. While this trait is slotted Tachyon Beam will now regenerate the shields of allies near the target. After achieving level 5 in the Presidio, Ty’Gokor or Vastam Class Command ship’s starship mastery, you will unlock the All Hands on Deck starship trait. While this trait is slotted, activating a Tactical or Command Bridge Officer ability will reduce the recharge time of Science Bridge Officer and Captain abilities. This may only occur once every few seconds. Q: Can you better explain how building Inspiration works in regards to team size? As mentioned above, Command Bridge Officer abilities will generate bonus Inspiration and the smaller your team size, the more Inspiration each individual contributor will add to the Inspiration pools of Command ships on your team. This bonus is largest when you are solo. That said, you will almost always fill your Inspiration meter more quickly when you’re on a full team.